Most experts assumed that appearance of new regimes in CIS countries was going to follow more or less similar rules and principles. Somewhat unique as it is, the Turkmen Version may become a model for other post-Soviet authoritarian states. 4. passiveness of the population intimidated by the repressive apparat. Central elements of the scenario therefore include legitimization of the new leadership as soon as possible under the slogan of continuation of their predecessor's policy; dismissal from the corridors of power of whoever does not belong to the group of representatives of top nomenclature; organization of election without any bona fide opponents to the "prime candidate" nominated by this fairly narrow circle. There can be no doubt that all of this will eventually split the group elevated to the pinnacle of political power. A number of objective reasons will compel its representatives to try and solidify their own positions and weaken those of others. This is what makes what is happening in Turkmenistan nowadays so interesting. As soon as Saparmurat Niyazov's death was announced on December 21, this narrow group of decision-makers all but did way with Overzgeldy Atayev, Chairman of the Parliament (Mejlis) and Deputy Chairman of the People's Council (Halk Maslakhaty chaired by the late president himself). Prosecutor General Muhammetguly Ogshukov pressed charges against Atayev. The latter is accused of abuse of power and of driving his adopted son's fiancee to suicide. Atayev was the inevitable target because the Constitution states that it is the chairman of the parliament who stands in for the president whenever the latter is unable to perform his functions for some reason. The Halk Maslakhaty in its turn wields broader powers that the Mejlis. This structure comprises 2,507 men - lawmakers, representatives of the state nomenclature, regions, and tribes. In other words, Atayev wielded too much power in terms of new regime's legitimization, and the decision-makers knew all too well that the People's Council was a factor they couldn't easily dismiss. That it was a crucial factor in implementation of the scenario, in other words. The acting legislation did not permit Atayev to become the president (people who stand in for the head of state are not supposed to become the president), but the People's Council he is deputy chairman of is capable of amending the Constitution. In short, Atayev did stand a chance of becoming the next president. Born in 1951, Atayev could even become Halk Maslakhaty chairman because the law reserves this position only for whoever is 55 years. The group of decision-makers then promoted to the parliament chairman Akja Nurberdyeva, Atayev's deputy wielding considerably few powers. 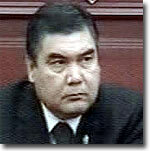 That accomplished, the decision-makers made Deputy Premier Gurbanguly Berdymuhammedov, 49, acting president. It was actually done in the name of the State Security Council. Defense Minister Agageldy Mamedgeldyev, 60, is Secretary of the State Security Council which includes representatives of the Defense Ministry, State Security Ministry (Minister G. Ashirmuhamedov), and Interior Ministry (Minister A. Rakhmanov). As a matter of fact, all these men are associated with Akmurad Rejepov, chief of the presidential security service. The situation being what it is, control over the Halk Maslakhaty is one of the principal factors of legitimization of the new regime. That is why the People's Council congress scheduled for December 26 will apparently settle the issue of its own chairman and deputy chairman in favor of the group of decision-makers. Mamedgeldyev will probably become the chairman in order to retain control over the situation and be able to act against potential rivals and candidates for president, these latter apparently including Berdymuhammedov. Somebody from the Interior Ministry will probably become Mamedgeldyev's deputy, and somebody from the State Security Ministry (Ashirmuhamedov himself or some protege of his) secretary of the State Security Council. As a matter of fact, somebody from the Prosecutor General's Office may be elevated to this position because this structure is known to be pals with the State Security Ministry. The situation with the post of deputy premier remains particularly tricky. Berdymuhammedov's "presidency" will probably mean institution of the post of prime minister and division of powers between the president and the premier. The narrow group of decision-makers must have thought it all out. Too many coincidences usually mean a pattern. Whether or not what we are witnessing follows a pattern is something we will see in the near future already.